ride and you will reach Cloud 9.
with their crew & 4 dogs they have been hosting travellers since November 2013. Marco and nick are amazing, if you need anything from scooter or just a hug they will be there for you! Wish I coule have stayed even longer than I did and I already extended 2 times, just because it felt like I found my home away from home! I love you guys, hopefully we will see again! Spent a week at Paglaom and it wasn’t long enough! Can’t speak highly enough of this place - beautiful people, amazing atmosphere and brilliantly run. Marco and Nic are absolutely lovely and do everything to promote a real sense of community. You’ll leave with friends for life and feel like a family the whole time you’re there. Definitely one of my best hostel experiences I’ve ever had! There are several group activities during the week so you really get to know and bond with everyone in hostel! Highly recommend! I wish I could stay even longer!!! 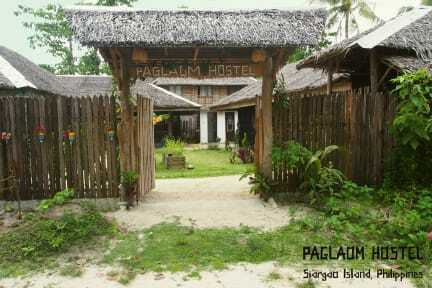 Paglaom Hostel, thank you! I will be back! I thoroughly enjoyed the possibilities that this hostel provided from bonding as a group, to individual accomplishments (ie. volunteering, surfing etc.) Marco and Nick were extremely approachable and very friendly to be around always. I felt safe and I felt glad to be in an environment that was encouraging, lighthearted and group oriented. The organization from the lockers, to the beds, to the tupperware in the kitchen impressed me. Great stay overall. Not a luxury hostel. But other that it has an amazing atmosphere, like one big family. The managers, Marco and Nick, are extremely helpful and knowledgeable about anything you need to know for a great stay on the island. This hostel is one of the best when it comes to socializing. If you stay here your dorm mates will become your group up until part ways. The two things i do not like about this hostel is the dorm room situation. It is a bit basic. And the bathroom situation could be better. It needs to be remodeled so it does not look too run-down. But i still highly recommend this hostel. 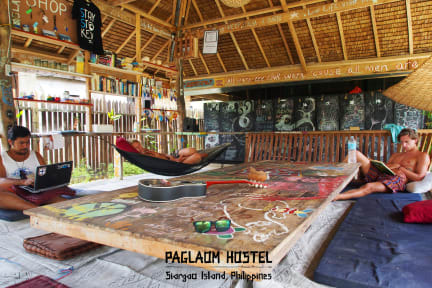 This hostel is a good example of the siargao vibe that is there in the island. chill place with a pretty awesome lobby. pretty close to everything and central area. Started off really well at this hostel, very welcoming to begin with. It also attracts a good group of people and travellers. However after an incident that didn’t involve the hostel what so ever, we were unfairly kicked out as in their words “they didn’t want any bad vibes”. Instead of supporting their guests like many other hostels I’ve been too in the past, they gave us no chance or help what so ever or listened to our side of the story. A very sad end to a promising start, Shame.